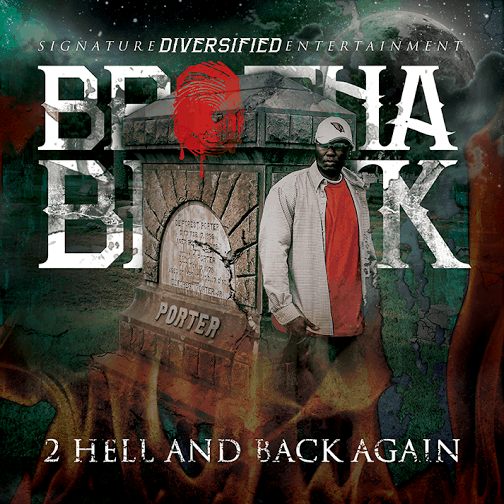 2 Hell & Back Again is the newest mixtape by Signature Diversified ENT recording Artist Brotha Blakk. The album chronicles survival tactics, tough times and the resurrection of an artist. Through near death experiences, to coming back with a vengeance, Blakk lives through his music. Songs like Breathin, Mile Away, Angel, Close my eyes and Hurricane, show fans the resilient side of a rapper dealing with inner demons. Songs of Triumph and success such as Life & Times, Money Motivated, Aint Worth My Time, and We Jus Want the $ show the constant growth through music. Fans never have to worry, he still gives then vintage Brotha Blakk on tracks like So When u See Me, Grindin, #1 Draft Pick, Love Em and Leave Em. He pays homage to the streets of Casa Grande where he was raised and where he acquired his game. Songs like My Song gives fans insight into his long journey through the ups and downs of the music industry. He also gives his new fans club anthems like Shut the Club down, showing his versatility as an artist. The rapper never runs out of things to say, as displayed in the song Off that Drank Freestyle. There is a little something for everyone on this mixtape. This is just an appetizer until Street Certified drops in December 2013. There are numerous producers on this mixtape. Blakk has incorporated the likes of Atomic beats, Nine Diamonds, Rollmeoh602, New Industry and Tone Chop just to name a few. Signature Diversified ENT is definitely representing real strong on this album. The Royal Family’s L-Mac & Tipsy Loc bring the heat on numerous tracks on the album. Theron D makes his presence felt by dropping a few hooks on the album. This mixtape has a little of everything for everyone.